Little Academy of Humble is proud to announce the hiring of our new Assistant Director Ms. Blumreiter. 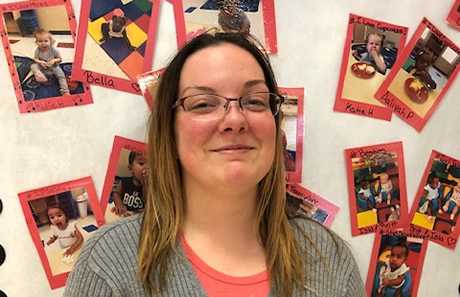 Ms. Blumreiter holds a Bachelor’s Degree in English and a Master’s Degree in Education and comes to us with numerous years of great professional experience in the education field. We are excited to have Ms. Blumreiter join our team here at Little Academy of Humble, and we know she will be instrumental in helping students continue to learn, grow, and thrive at our school. Hometown: Military brat so I don’t really have a hometown but I was born in Gwinn, Michigan. Education: Bachelors in English, Masters in Education, and working on another Masters in Business Management. Years of Experience: 9 years total in education. Why I wanted to be a teacher at Little Academy of Humble: When I came in for an interview the atmosphere was warm and welcoming. The faculty made me feel like a part of Little Academy family. I realized around 2nd grade that I wanted to become a teacher and that passion has never changed. Over the years growing my education, I taught 1st through 5th grade special education and a few years of high school English; however, I have a background in Montessori and that is what I enjoy the most. I grew up in a Montessori atmosphere and my first assistant director position was in a Montessori school. My current goal at Little Academy is to bring my expertise and blend the current curriculum with a Montessori curriculum. When I am not studying to further my education, I am enjoying time with my family. Although I am a military brat and I do not know where to call home I do know that my nieces have my heart and I enjoy spending every moment I can with them. In my spare time I enjoy writing and hope to publish a novel in my lifetime. I also am a huge Green Bay Packer fan but am enjoying the warm Texas weather these days. Thank you for letting me be a part of the Little Academy family.